WB: Recombinant Human gamma Tubulin protein (denatured) (ab115710), A431, HeLa, Jurkat, C2C12, Rat2, U87, NIH3T3 and CHO cell lysates. ICC/IF: NIH3T3, HeLa and Rat2 cells. Our Abpromise guarantee covers the use of ab11317 in the following tested applications. It is recommended to fix cells with methanol/acetone. WB 1/1000. Detects a band of approximately 48 kDa. This concentration was determined for A431 cultured cells extract. Block with 5% BSA in TBST (not milk). Detects a band of approximately 48 kDa. Additional bands can occasionally be seen. 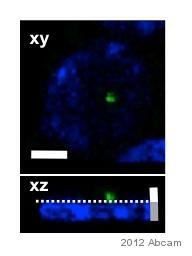 Immunocytochemistry/Immunofluorescence analysis of NIH3T3 cells labelling gamma Tubulin (green) with ab11317 at a dilution of 1/1500. 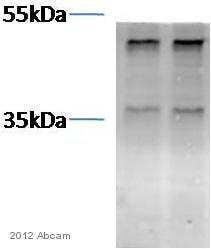 A Atto448 dye conjugated goat anti-rabbit IgG was used as the seondary antibody. Actin was stained with phalloidin rhodamine conjugate (red). 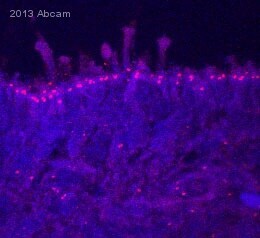 Nuclear staining with DAPI (blue). 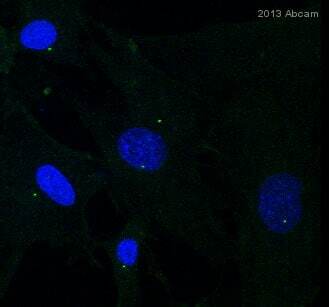 Immunocytochemistry/Immunofluorescence analysis of HeLa cells labelling gamma Tubulin (green) with ab11317 at a dilution of 1/1500. A Atto448 dye conjugated goat anti-rabbit IgG was used as the seondary antibody. Actin was stained with phalloidin rhodamine conjugate (red). Nuclear staining with DAPI (blue). ab11317 staining gamma Tubulin in mouse embryonic brain tissue sections by Immunohistochemistry (IHC-P - paraformaldehyde-fixed, paraffin-embedded sections). Tissue was fixed with paraformaldehyde and blocked with 10% serum for 1 hour at 20°C; antigen retrieval was by heat mediation in 1mM EDTA. Samples were incubated with primary antibody (1/500 in blocking buffer) for 1 hour at 20°C. 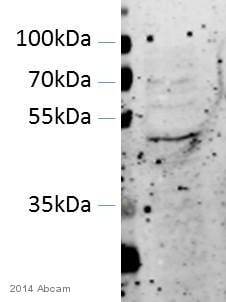 An Alexa Fluor® 568-conjugated goat anti-rabbit IgG polyclonal (1/500) was used as the secondary antibody. 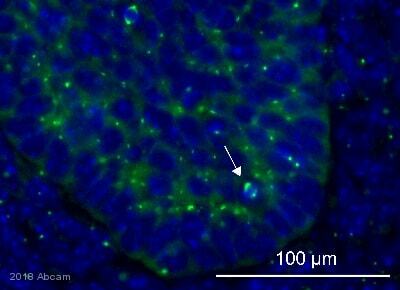 Immunocytochemistry/Immunofluorescence analysis of Rat2 cells labelling gamma Tubulin (green) with ab11317 at a dilution of 1/1500. A Atto448 dye conjugated goat anti-rabbit IgG was used as the seondary antibody. Actin was stained with phalloidin rhodamine conjugate (red). 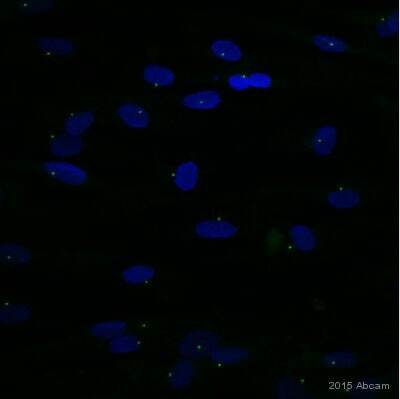 Nuclear staining with DAPI (blue). Publishing research using ab11317? Please let us know so that we can cite the reference in this datasheet.